Long out of circulation, the legendary legal series The Defenders makes its belated arrival on DVD with a new Season One set from Shout! Factory. Starring E.G. 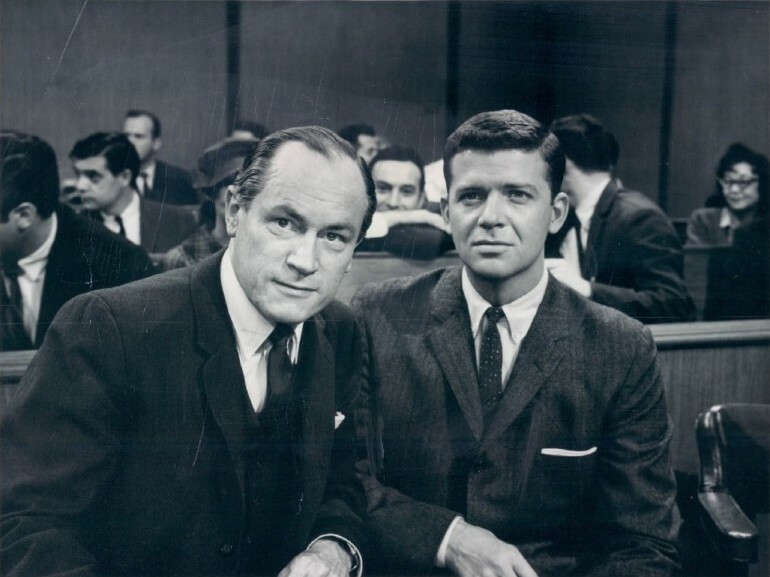 Marshall and Robert Reed as a father-son team of defense attorneys, the show displays the intelligence and idealism of the best early television drama, even though it hit the airwaves in 1961 (technically after TV's original Golden Age). 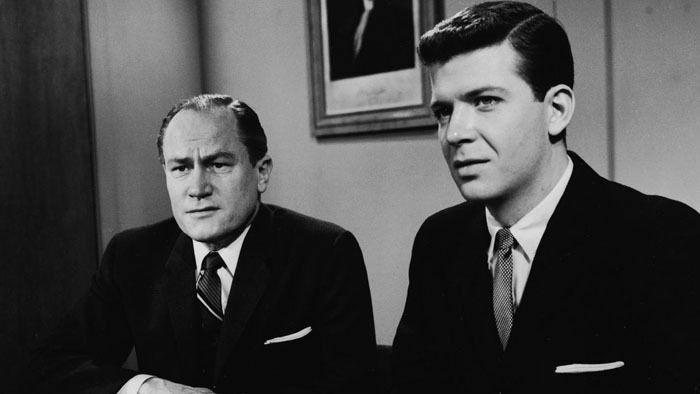 Created by 12 Angry Men writer Reginald Rose, The Defenders is not a mystery show in the Perry Mason/Matlock mold (although season one features a few different episodes where one of the hero attorneys gets a witness on the stand to confess that they, in fact, are the real perpetrator of the crime in question). Instead, the show uses its cases to explore the many grey areas that exist between common morality and what the law demands. Lawrence Preston (Marshall) is a well-respected New York lawyer, whose years of experience give him an unassailable authority -- although the show makes certain that he is still fallible. His son, Ken Preston (Reed), is whip-smart but more emotional and somewhat impetuous compared to his father. Their cases lead them to tackle hot button issues, such as abortion, pedophilia, drug addiction, mercy killing, and mental illness. Because of television standards at the time, sometimes the writers are required to talk around these topics, but the boldness of the subject matter is still quite bracing. The show's point-of-view is unrepentantly liberal, which is what makes it feel simultaneously fresh and dated now. Many of the show's storylines reflect debates that continue to go on today, but from a relatively "un-woke" '60s perspective. The most glaring example of the disconnect between how enlightened The Defenders hopes to be and how enlightened it truly is, comes in the show's first episode, where a baby with Down's syndrome is consistently referred to as a "mongoloid idiot" by a number of well-meaning characters. Of course, progress has to start somewhere, and fortunately The Defenders is concerned with being a smart, entertaining show (at least a bit) more than it is concerned with preaching an agenda. The episode for which The Defenders is currently best known is the one concerning abortion, "The Benefactor," because of its incorporation into the second season of Mad Men. The show lost some sponsors because of the subject matter, but "The Benefactor" was well-received by viewers and critics. Viewed now, the episode is a little hokey and heavy on earnest speeches, but it's also dramatically tough and still packs an emotional wallop. A kindly old doctor (Robert Simon) is arrested for performing illegal abortions, and though he knows he technically broke the law, he hopes that the Prestons will help spread the message that the law is unjust. The doctor has a personal reason for this point-of-view, which he does not freely share with his lawyers, but Lawrence discovers it and uses it to strengthen the doctor's case. It's not a spoiler to reveal that the doctor doesn't win the legal victory, but the show makes its case that he may have made a step toward a moral one. In "The Iron Man," the show flips this dynamic, with the Prestons winning a case for a crypto-Nazi law student that they don't like or respect, because even he deserves fair representation in court. In "The Attack," the Prestons defend a cop who killed the man he thinks molested his five-year-old daughter, doing their job while quietly hoping that the jury's natural sympathy for a grief-stricken father will not override the need for fairness and justice. In its best moments, The Defenders leaves its grey areas grey, both in terms of plotting and theme. Sometimes the Prestons win their cases and sometimes they lose. Sometimes the losses are for the best and sometimes they are not. Sometimes capital-T Truth is best served by the justice system and sometimes it is not. Marshall and Reed anchor the show beautifully, with their mild generation-gap variations on the straight-arrow, square-jawed American Truth Seeker. In a few early episodes, the show tries to give Reed's character a romantic life, with Joan Hackett as his patient girlfriend, but (arguably, for the best) her story gets pushed aside as the series eventually becomes fully focused on the Prestons at work. The Defenders' first season boasts plenty of talent, on both sides of the camera, who would go on to bigger things. A few of the men who make recurring appearances in the director's chair include Franklin J. Schaffner (Patton), Stuart Rosenberg (Cool Hand Luke), and Buzz Kulik (Brian's Song). Martin Sheen appears on camera as two different troubled street kids (in different episodes, natch), Gene Hackman plays the reluctant father of the baby with Down's, Jack Klugman plays one of the show's many prosecutors, William Shatner (who played the Robert Reed part in the original incarnation of The Defenders -- see Special Features below) plays an unwitting murderer, Clu Gulager plays a well-meaning drug addict, The Waltons' Richard Thomas plays a child caught in the middle of a messy custody battle, Frank Gorshin plays (with surprising gravitas) a nightclub impressionist with possible split personality disorder. And the guest stars list just keeps going: Robert Duvall, Robert Loggia, Ossie Davis, Martin Balsam, James Earl Jones, Pat Hingle, Nancy Marchand, Barbara Barrie, Elizabeth Ashley, Eva Gabor, Julie Newmar, Bill Gunn, Conrad Bain, Gloria DeHaven, Al Lewis, William Daniels, Jerry Stiller, Richard Mulligan, Vincent Gardenia, and on and on and on. If you've never seen The Defenders -- and chances are, you haven't -- seize the opportunity to check it out now. It's a good one. The 32 episodes of The Defenders: Season One are presented on 8 DVDs, with another disc for special features. The discs are housed on back-to-back hubs in a single wide, sturdy keepcase. Although you will see an occasional disclaimer about certain episodes being presented from "the best available elements," none of the included shows are distractingly damaged or hard to watch. Contrast levels in the black-and-white standard 1.33:1 video fluctuate, sometimes giving the image a washed-out look. Detail is fair. The video encode is a little noisy now and again, but compression is not a major issue. There tends to be surface hiss and crackle on the Dolby 2.0 mono audio, plus clicks and pops, but none of it obscures the dialogue, which is consistently easy to make out. That's good, because the disc offers no subtitles or captions. 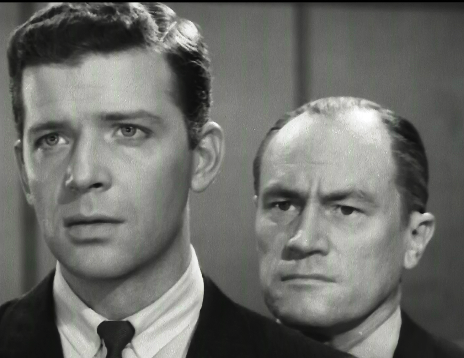 Studio One: "The Defender" (Parts 1 & 2) (1:43:02) - Previously released on DVD a decade ago, this is Reginald Rose's original 1957 teleplay that inspired the series. Ralph Bellamy and William Shatner play the Prestons, Steve McQueen is the accused, and Martin Balsam is the showboating prosecution. In a nutshell: McQueen is a hot-headed jerk up for murder, Bellamy assumes he's guilty and decides to do the bare minimum in defending him, but sonny boy Shatner feels it in his gut that McQueen's innocent and tries to move his father to prove it. The story is effective and entertaining, much like the show it spawned. Pilot Episode - Original, Extended Version (58:57) - A VHS rip of the original pilot, which was slightly retooled and eventually used as the third episode of the series, "Death Across the Counter," with Clu Gulager as a junkie accused of a murder he doesn't quite remember. There are differences in production design, casting, and tone, in comparison to the actual series, which makes this a valuable artifact. Interview with associate producer Bob Markell (10:51) - A concise, informative chat about the show's first season that also touches on Markell's work on the original "The Defender" as a set designer. Interview with Larry Cohen (11:44) - Low-budget auteur Cohen talks about getting his start as a writer for TV, and how he started writing for The Defenders with a spec script written while Cohen was in the Army Reserve. He also compares the way writers were treated back during the Golden Age versus now (surprise: it was better then). Vintage Interview with actor E.G. Marshall (7:22) - This is an excerpt from a 1973 college TV show, hosted by public broadcasting pioneer James Day. The chat is energetic, as the two men discuss how the success of The Defenders impacted the way Marshall was perceived by audiences and the roles he would get offered as a result. One of the best legal dramas ever broadcast finally arrives on DVD. New viewers might be struck by how the show is both boldly progressive and oddly old-fashioned at the exact same time, but the strength of the writing, the directing, and the performances make it irresistible even so. Highly Recommended.